Product code: ES2859 Categories: Sold Items, Sold Jewellery. 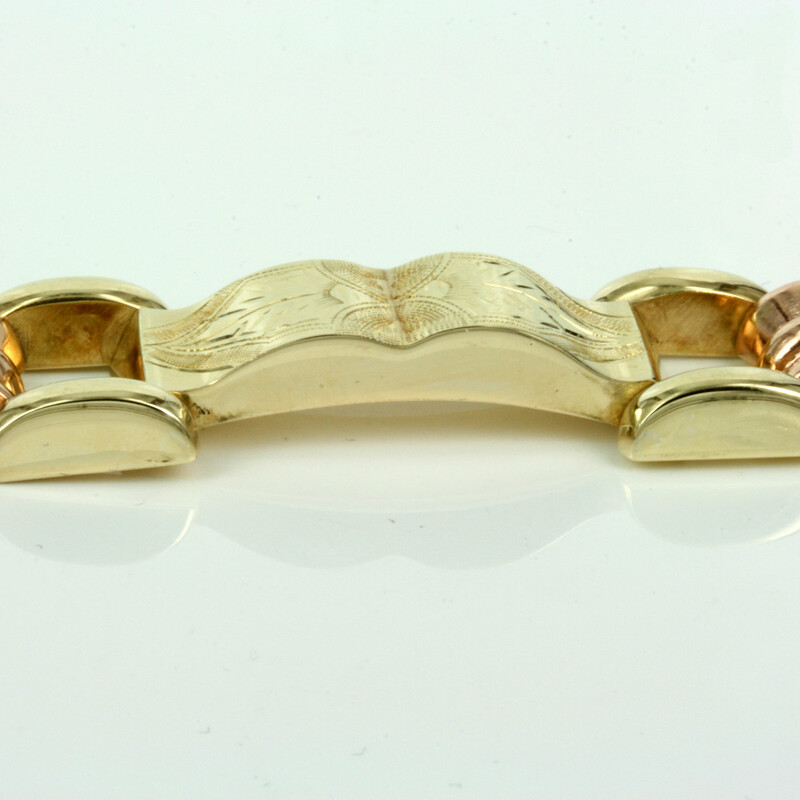 This is such an attractive Retro period bracelet that was made in Vienna Austria around 1940 and made in such a fabulous design. Made in 14ct gold, this Retro bracelet is made in not only 14ct yellow gold but 14ct rose gold which gives this bracelet such an elegant contrast and the rose gold has that lovely warm colour that looks so good against the skin. 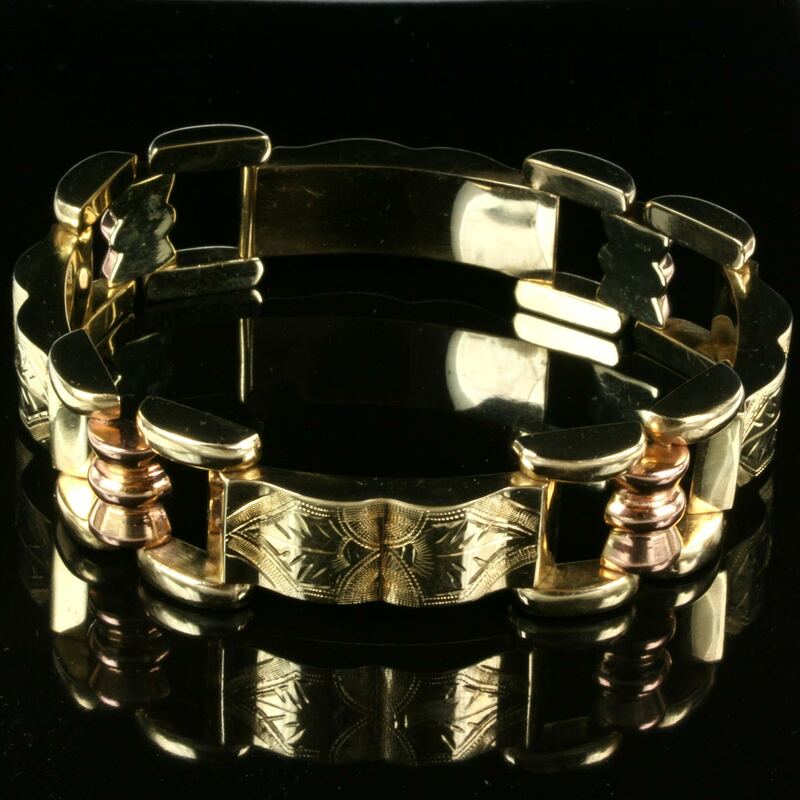 Bearing the hallmarks for being made in Austria it also has the town mark of Vienna and this bracelet is typical of the work being produced in Europe in the late Art Deco to early Retro era of the 1940’s. The design of this bracelet is so wonderful with the polished yellow gold sections separated by the rose gold bars and then the long yellow gold pieces all wonderfully hand engraved to give it that something extra and adds the right amount of charm and character to it. Measuring 19.6cm in length making it very easy to wear by everyone as sometimes bracelets are too short and don’t fit many people so this bracelet will be no problem at all. The width in millimeters is 17.3mm wide at its widest part or 10.7mm wide on the long engraved yellow gold sections making this a wonderful Retro era bracelet that stands out so nicely and is very easy to wear day or night. Bracelets from the Retro era are always exciting to wear and this bracelet from Austria is simply superb and the combination of both 14ct rose and yellow gold makes it an even more attractive piece of Retro jewellery.